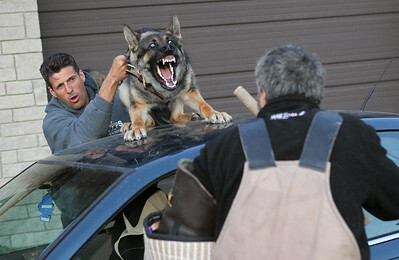 Candace H. Johnson-For Shaw Media John Lanctot, a Kenosha County deputy sheriff, holds his dog, Fritz, as they practice a bite scenerio with Nick Choukas, of McHenry, a trainer, on the hood of a car during a TOPS Police K9 Training session in a parking lot on Commerce Drive in Grayslake. Candace H. Johnson-For Shaw Media Marshall Kite, an Elgin police officer, works with his dog, Tango, on an obstacle course at TOPS Kennel during the Police K9 Training Program in Grayslake. Candace H. Johnson-For Shaw Media Deputy Craig Somerville, Jr., with the Lake County Sheriff's Office, works with his dog, Diesel, on finding drugs hidden outside of the Gurnee Public Works facility during a TOPS Police K9 Training Program narcotics training session. 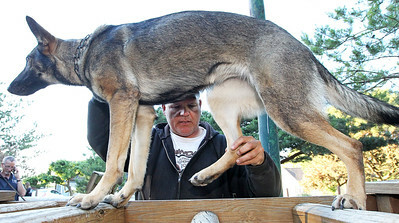 Candace H. Johnson-For Shaw Media Chris Koch, a Niles police officer, works with his dog, Ace, on going up metal viewing stands during an obedience class given by the TOPS Police K9 Training Program at the Lake County Fairgrounds in Grayslake. 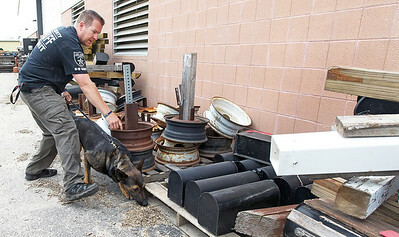 Candace H. Johnson-For Shaw Media Dave Lemmer, a Bannockburn police officer works with his dog, Odin, to search for drugs planted in the Gurnee Public Works facility during a narcotics training session given by the TOPS Police K9 Training Program. Candace H. Johnson-For Shaw Media Deputy Craig Somerville, Jr., with the Lake County Sheriff's Office, praises his dog, Diesel, after completing a narcotics training session given by the TOPS Police K9 Training Program at the Gurnee Public Works facility. 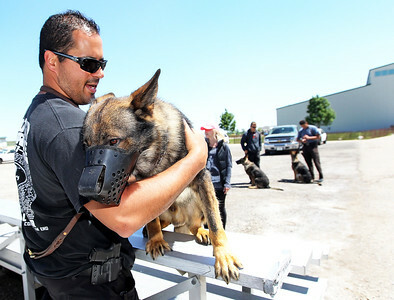 Candace H. Johnson-For Shaw Media Police officers stand with their German Shepherds during an obedience class given by TOPS Police K9 Training Program at the Lake County Fairgrounds in Grayslake.The dogs come to TOPS directly from either the Czech Republic or Germany. Candace H. Johnson-For Shaw Media Alex Rothacker, owner and trainer of the TOPS Police K9 Training Program, (second from the right) talks with Nick Choukas, of McHenry, trainer, Chris Koch, Niles police officer, Paul Cosman, McHenry County deputy sheriff, and John Lanctot, Kenosha County deputy sheriff, about putting their dogs on top of a car to be able to handle slippery surfaces during a bite scenerio in a parking lot on Commerce Drive in Grayslake. 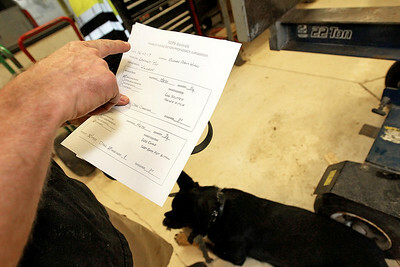 Candace H. Johnson-For Shaw Media Keith Lamanna, a Waukegan police officer, shows the TOPS Kennels narcotics detection proficiency assessment for his dog, Jax, after a narcotics training session at the Gurnee Public Works facility. 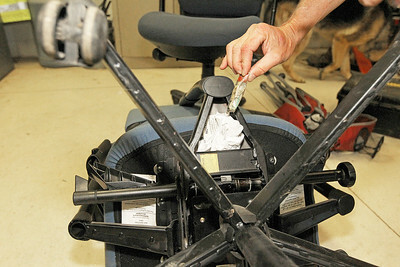 Candace H. Johnson-For Shaw Media Paul Pomazal, of Mundelein, a TOPS K-9 Training Program director, takes out the drug, methamphetamine, from under a chair in the Gurnee Public Works after a narcotics training session for police dogs. 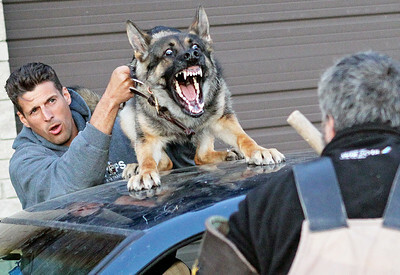 Candace H. Johnson-For Shaw Media John Lanctot, Kenosha County deputy sheriff, puts a leash on his dog, Fritz, before working on a bite scenerio set up by the TOPS Police K9 Training Program in a parking lot on Commerce Drive in Grayslake. Candace H. Johnson-For Shaw Media Keith Lamanna, a Waukegan police officer, gives his dog, Jax, a special reward toy to play with and praises him after completing a narcotics training session given by the TOPS Police K9 Training Program at the Gurnee Public Works facility. Jax came from Germany and has a German passport. Keith Lamanna, a Waukegan police officer, shows the TOPS Kennels narcotics detection proficiency assessment for his dog, Jax, after a narcotics training session at the Gurnee Public Works facility.